Sales of three annually issued proof sets have been delayed because of a packaging error, the United States Mint said today. The quarters proof set had launched on Jan. 11. It was available for a short time until the error was discovered and its sales suspended. Customers that received the set may return it for replacement. All three sets have proof coins that are placed in protective lenses that ship inside of illustrated boxes. The printing error was found on the box for the quarters. 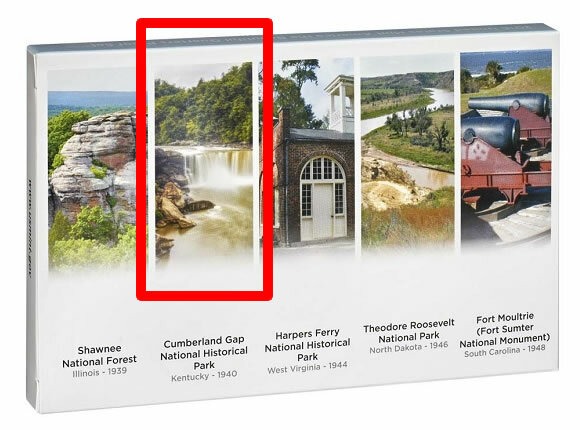 Specifically, an incorrect image of the Cumberland Gap National Historical Park was used. The park is one of the five national sites commemorated on 2016 quarters with a unique reverse design. The same error also affected the other two sets. The 2016 Proof Set was originally scheduled to launch on Feb. 29. The release date for the 2016 Silver Proof Set had yet to be announced. April is now the target month for all three sets. "We expect all three products to be available for sale in the April timeframe," Tom Jurkowsky, director of the U.S. Mint’s Office of Corporate Communications, said in an e-mail statement. "The Mint deeply regrets the error and any inconvenience it has caused to its customers," he added. Look to the Mint’s online schedule for updated release dates as they become available. Gosh, thought for a moment we had a real error in a piece of enclosed currency. Oh well, one can dream. I guess the Mint folks responsible for this were too busy doing something else. It still doesn’t explain why the Silver ATB proof set was error free, since isn’t it supposed to come out before the full fledged regular proof sets? And wouldn’t it use the same cover box as the clad ATB proof set? I think the silver quarter set is also affected they just missed it in their press release. I can understand errors can happen but I cannot understand the delay on the regular proof set – our company could easily have them new boxes in two weeks or so – they are pushing back a Feb 29 release date into April. Very collectable error for a box. Par for the course with the MInt …. last year 2015, they released the clad ATB proof set on Feb 3rd, followed by the Silver ATB proof set on Feb 20th …..
And this error would not have occurred if only the Mint had kept using its plain vanilla packaging. I checked my silver proof sets from 1999 (when I got hooked on the statehood quarters) and it wasn’t until 2013 that the Mint started using full color boxes along with full color photos including each state’s parks. All at an increase in printing cost of course and guess who they pass it along to? An incorrect image? 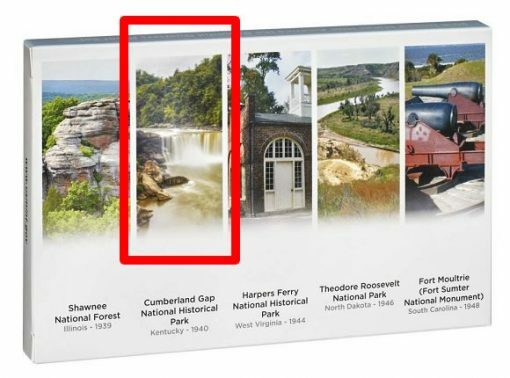 Does that mean it’s not the image of Cumberland Gap they wanted to use or not an image of Cumberland Gap at all? For myself I don’t even look at the pictures on the box – it’s the coins I’m collecting. Still, just more evidence in my mind that a bureaucrat in the position of “Principal Deputy Director” serves no other purpose than to draw his paycheck. We need an actual Director of the Mint whose job it is to run the mint and take responsibility for the mint and the quality of it’s coins and associated packaging than some temporary bureaucrat. Keep Calm & Stack On! The photo of the falls is located in the State Park, not the Cumberland Gap National Historic Park which is to the east a ways from the falls. Thanks for answering my question about the exact location of the color photo the Mint used in error on this new product. Does the Mint not have access to Google maps & images!? Simply amazing & a sad situation really. Even more bizarre–the pictures on the box don’t always reflect the actual coin images anyway. I sent a nasty note to the Secretary of the Treasury about Jeppson and his incompetencies regarding the poor quality of the American Liberty High Relief Gold Coin and the delaying of the silver Twains and these three coin sets. I expect he’ll never see it but maybe, just maybe, whoever does read it may mention something to Secretary Lew. Since the ATB quarters proof set is the only one that got out I’m wondering if there might be a premium for the error package. Kinda like a premium for a special piece of paper (e.g. first strike) with a graded coin. Ah, but then they’ll probably just toss the errors in the dumpster and the guy who put a nail in the dime press will collect all the error packages and auction them off. Good for you for writing Jeppson’s boss with your complaints! U.S. Mint Principal Deputy Director Matthew Rhett Jeppson is a U.S. Marine Corps veteran, so you don’t want to piss him off in person! Lol. But his boss Secretary of the Treasury Jacob Jack Lew is an intelligent, reasonable man & all U.S. Mint executives answer to him. Let us know if you get a response from the boss! Thanks Jim. I just used the Send a Message to the Secretary web page which has no sender information and I didn’t include my email in the message, so no response expected. I did write on paper a note to Geithner complaining about Peterson, Jeppson’s predecessor. If nobody else wrote then my letter was the impetus to reinstate the product schedule which Peterson stopped doing once he took over. Little good it does these days with so many TBDs but still a general idea is better than none at all. The Send a Message to the Secretary web page is an easy way to vent and I know an actual paper letter has more impact but I don’t happen to have a printer so more of an effort for me. Maybe if more screw-ups occur I’ll resort to paper. Too bad that ex-Marine is not seen to be running a tight ship, or running any ship at all, even though he is the captain. IMO he could give the Marines a bad name if he keeps “managing” the Mint this way. Both Peterson and Jeppson have failed in their job as Deputy Director of the Mint. But it’s not all their fault. You can blame our do-nothing Senate for stalling and failing to do their job to advise and consent on Presidential appointments including among other positions Director of the US Mint. The mint needs to PULL ALL 2015 proof and silver AtB products immediately. The 2015 product packaging for Bombay Hook shows a heron walking on a picturesque sandy beach adjacent to beautiful blue water. Nice work on finding out that 12000 were sold. Is it possible that it really isn’t the picture, but to cast a shadow to a mint error? Has anyone looked closely at thier coins? Does anyone see something strange with the “A” in Shawnee on the Illinois coin? What do you think? So here’s where I’m at. With technology today, you will very rarely get major errors. Sure if I loop any coin long enough I can find something and call it a “Vam”. Case in point. The 2008 silver eagle reverse of 2007. In 30 years of silver eagle minting, that’s it. hundreds of millions minted and only something like 30K made it to market. So what’s my point? Simple, the best one can hope is the occasional human error like the packaging on these 2016 proof quarters. PS- I guess I was one of the lucky 12,000 because I am the subscription for the ATB quarters. They emailed me if I wanted to return. I will hold mine in hopes that the value will increase. PS- smileyleg, I looped the A and do not see a thing. Happy collecting people! And so now the packaging (something which nobody cared about before) begins to add value to the coin set. I wonder how the graders will acknowledge the mistake in packaging. Just received the 2016 Nixon Dollar cover set, one minted first day of mintage in Denver and one in Philadelphia. I’m not a Coin expert but I can tell the difference between these coins. The one from Denver looks like it’s almost proof like compared to the one from Philadelphia Mint.